Inside: Wanting to get the kids off the screens for a bit? We have a list of fun board games the kids and even the whole family will enjoy playing. By the time kids reach elementary school, they start to become addicted to screens. Video games are fun, but how about some in-person interaction? Games are an excellent way to teach cooperation, beat boredom, and encourage strategic thinking. Our house is home to a lot of games. We’ve raised the kids on them and it is a great way to get some family time in and a way to keep the kids from being bored all the time. In the process of playing and acquiring games, we’ve found many that the kids have particularly enjoyed. I also researched a few more popular titles that would make great additions to your game collection. What can I say? This is a perfectly silly card game the whole family can play. Our son begged us for months to get this game. We finally gave in and got it for his birthday. He couldn’t have been happier. Players have a set of cards and they draw a card and can play cards each turn. When an exploding kitten appears, they die (are out of the game) UNLESS they have a defuse card. The last player left in the game wins. This is perhaps my daughter’s favorite game. It is a lightweight card game with cute graphics the kids enjoy. Players play 3 rounds. In each round, they try to make the best combinations of food for points. The person with the most points, wins! This popular card game is one some preschoolers could play as well. Players start with four cards face down. Each takes a turn drawing and replacing cards, with a goal of having the lowest score at the end. Each player has a set of tiles and scores points by getting rows of same shape or same color tiles. Players play and draw a tile in a manner similar to Scrabble. The person with the most points at the end wins the game. This card game is one that girls in particular seem to enjoy. Players try and awaken enough queens and points to win the game. It is a quick game (about 15 minutes) and involves dragons, potions, jesters, knights and kings! In this game, there are object set before the players. As a card is revealed, the first player to grab the correct object wins that card. The player with the most cards at the end is the winner. This is a fast paced game that kids seem to win more often than the adults. Watch out! How good of a swimmer is your robot? Can you stay ahead of the shark? Each player has a set of cards and chooses one to reveal each round. Lower numbers end up at the end of the line and higher numbers move up. The robot at the end of the line in the round loses a limb. At some point, your robot dies and the person remaining wins. This is an easy, lightweight game kids enjoy. The game play is a bit random. Each player starts with three cards. On a basic turn, a player draws a card and plays a card. However, the rules change as you go meaning a game could last 5 minutes or 30 and you never know who will win or how. Want to sneak a bit of math into a kids game? Incan gold has you seeking adventure and treasure. Each turn, you either divide treasure amongst players (division! sneaky), bail, or are attacked. The goal is to emerge from the game with the most treasure after five rounds. This is a good spaceship deck building combat game for an older child (at least 10+) and enjoyable for adults as well. You won’t be bored! My son has gotten me to play this with him many times. This is an award-winning cooperative game where players work together to defend their castle from monsters. While the team as a whole wins or loses, only the player with the most points can be called the Master Slayer. Castle Panic allows you to customize the game’s difficulty with rule variations and accommodates anywhere from 1 to 6 players. Board games for elementary school aged kids generally have a shorter to medium play time and are a bit more challenging than preschool games. It is easy to have family game time with these games. 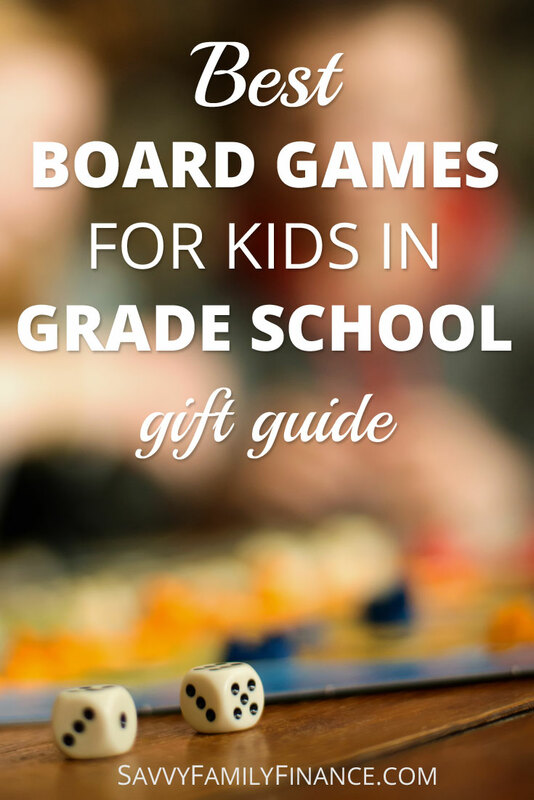 What are your favorite board games for kids ages 5-11?